Ball Pythons will do best on Zoo Med’s Aspen Snake Bedding, Forest Floor cypress mulch, or ReptiBark®. We recommend a substrate layer of 2.5-3″ in depth. Provide moistened New Zealand Sphagnum Moss in a Repti Shelter to create a humidity chamber. This chamber will help your snake shed it’s skin as it grows. Zoo Med’s Eco Carpet can be used as a safe, environmentally friendly and easy-to-clean substrate. 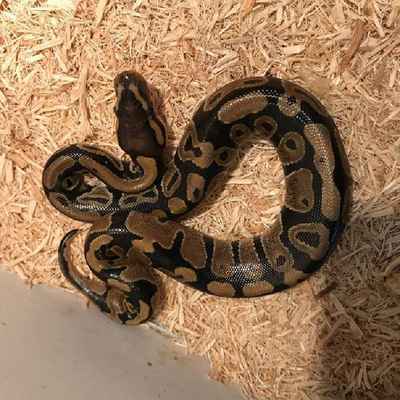 When selecting a Ball Python of any age or size, we recommend purchasing Captive Born and Bred animals. Captive Born Ball Pythons fare better in captivity and have fewer problems associated with parasites and disease. Captive born Ball Pythons also tend to be more docile and have fewer problems feeding. Purchase a quality book on the care and husbandry of these animals before bringing any animal home. Ball Pythons can be fed exclusively mice and rats throughout their lives. Have fresh water available at all times. ReptiSafe® Water Conditioner is a good choice for removing Chlorine and Chloramines from tap water. Zoo Med’s Corner Bowls are an excellent choice water bowl for all snakes. Food items should be no wider than the girth of your snake. Hatchlings: Will eat 1 hopper mouse per week. Juveniles: Will eat 1 adult mouse or rat pup per week. Adults: Will eat 1 appropriately sized rat or 2 adult mice per week. Hatchling to juvenile Ball Pythons (under 3′) can be housed in a 20 gallon terrarium. Adult Ball Pythons will need at least a 40 gallon terrarium. We recommend keeping Ball pythons in an enclosure that is no shorter than half the length of the snake. Hatchling Ball Pythons can be housed together, however juveniles and adults should be housed separately. Daytime Terrarium Temperature 80-85°F Basking Temperature 88-93°F Nighttime Terrarium Temperature 75-80°F Create a thermal gradient in your snake enclosure by placing a heat lamp and an Under Tank Heater on one side of the terrarium. Zoo Med’s Daylight Blue Reptile Bulb is a good choice for heating snake enclosures. Any of Zoo Med’s thermometers will help you keep a close eye on terrarium temperatures. Keep all hides, such as a Repti Shelter™ or Habba Hut™ on the cool end of the enclosure. An Under Tank Heater is essential to provide belly heat to your snake while it digests a meal. Snakes typically do not require UVB to meet their vitamin D requirements. However, many snakes receive UVB and sunlight in their natural habitat and there is new evidence that they benefit from UVB lighting in captivity. Zoo Med’s NatureSun® or ReptiSun® 5.0 fluorescent lamps can be used to illuminate your terrarium and create a photoperiod (light cycle) that will keep your snake on natural day/night cycles.